I spent Memorial Day this year with my cousin, John. I came across him about eight months ago for the first time in the way distant cousins sometimes meet these days, on the Internet. His name had just popped up, as names do, in the course of researching my mother’s Schiavone family history. But I was with him in name only, because he was killed in action in the Vietnam War 49 years ago this month. In the late 1960s and early 1970s, as the eldest of four sisters, I was a young teenager with limited exposure to the war other than my parents’ conversations at the dinner table, my classmates’ occasional references to their brothers’ draft numbers, and the latest developments on the six o’clock news. Not until I grew older did I read numerous accounts of the conflict, many of them first-hand. But I never knew anyone personally who had been there, odd as it might seem. When John’s name and photograph appeared on Ancestry.com late one night in 2017, I was struck by his youth and earnest expression. He would have been only seven years older than me. Slender and handsome, with short, dark hair, lively eyes, and a gregarious smile, he seemed like the boy next door, the kind of guy you would want to know better, the guy who’d stick up for you when you needed him. I wanted to know more about him and began investigating. John Francis Mattarocchia, Jr., was my second cousin, our having shared the same great-grandparents, Vito and Emanuella (Sannella) Schiavone. He was born March 2, 1948, barely three years after the end of the Second World War. The son of Italian-American parents, he grew up in Revere, Massachusetts, a suburb of Boston, in a working class family. It was the same city where his maternal grandmother, Filomena Schiavone, and her parents, Vito and Emanuella, had immigrated from San Sossio, Italy, at the turn of the 20th century. His father, John Francis, for whom he was named, had been a laborer in a shoe factory in Revere, as had a lot of Italian-Americans there, including many of the Schiavone men. John Sr. had gone on to serve his country in the United States Air Force in World War II and the Korean War and made his way up the ranks to warrant officer. John’s mother, Marinella Evelyn (Scicchitani) Mattarocchia, one of eight children, had been orphaned at age 16 when her mother, Filomena (Schiavone) Scicchitani, died prematurely in 1941. Filomena, a naturalized citizen, had been a popular active local leader in the Democratic Party, and on the day of her funeral, it was said all the Democratic politicians in the area joined with Catholic mourners in a long procession down the streets of Revere, mourning her loss. Coming from this patriotic family background, it must have seemed natural for a promising 20-year-old like John to follow in his father’s footsteps, and he enlisted in the United States Army on March 25, 1968, bound for Vietnam. What was not natural was that his life would be snuffed out mercilessly just over a year later. John’s tour of duty began on October 12, 1968. He was a Sergeant, Specialist E4. He was assigned as a helicopter mechanic, but his title was a mouthful: Single-Rotor Turbine Observation Utility Helicopter Repairman. He was assigned to the 3rd Brigade, Company HHC, of the 1st Cavalry Division. 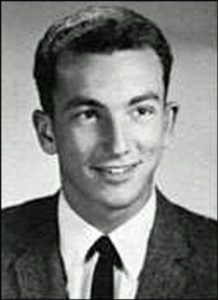 He was a crew chief on a flight reconnaissance mission above Tây Ninh province in southwestern Vietnam on Monday, May 5, 1969, when his aircraft, a Hughes OH-6 Cayuse, single-engine helicopter, was hit seven times by enemy fire. The chopper exploded and crashed. One crewman was wounded. John was severely burned in the explosion. He died two days later of his injuries. He was barely 21 years old. At around the same time, half a world away in California, I was about to turn 14 and was giddily planning my eighth grade graduation party with my mother. I had no idea her cousin back in Massachusetts had received the most devastating news of her life and was dreading her son’s homecoming in a body bag. The Vietnam Memorial was one of the first monuments I visited in 1985 during a trip to Washington, D.C. Like most visitors, I traced name after name with my fingers, wondering who those young people were and how they had died. I wonder if I read John’s name, or was even near it. He is listed on the VVM Wall, Panel 25w, Line 17. 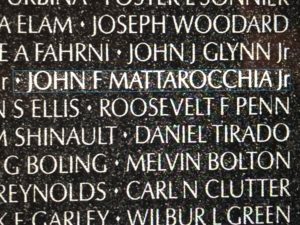 John F. Mattarocchia’s name on the Vietnam War Memorial Wall, Washington, D.C. May he rest in peace. There is another memorial to John, a beautiful bronze sign that bears his name. 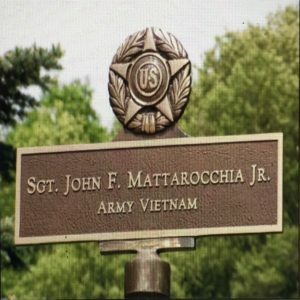 It stands proudly in Hero Square near the Mattarocchia home in Ipswich, Massachusetts. I don’t know what happened to John’s parents, or even his brothers or sisters, if he had them. I can’t even begin to imagine the pain they felt through the years on birthdays and holidays and anniversaries, especially days like today. What I do know is that John made the ultimate sacrifice, and in so doing, his family did, too. They lost a beloved son, a grandson, maybe even a brother and a friend. If only I could have known John and the Mattarocchias. Their life and sacrifice have given meaning to my Memorial Day. I thank God for them and for so many other men and women and their families who gave not some, but all. A lovely tribute indeed. I was in high school during the Vietnam War. As part of a class assignment in my journalism class, we always interviewed the boys coming back from the war and visiting their old school. It was difficult to interview them. You could tell they didn’t want to have to dredge up answers to “What was it like …?” The Vietnam Memorial in Washington DC is wonderfully moving and sad. I like when communities create their own memorials to the locals who gave their all. Thank you, Wendy, for sharing your story. How challenging that must have been for you and your classmates! The horrors and atrocities soldiers witness at war and the trauma that haunts them afterwards are unfathomable for those of us left behind. Maybe we should be asking, “how can I support you?” instead. I hope we will always remember the sacrifices of so many and keep their stories alive, so we can promote a world that values love over hatred. Linda, this was a wonderful tribute to John. I think war is always miserable especially when one considers the young lives that were (and continue to be) snuffed out before they’ve barely begun. It’s all so sad. I don’t know anything about the Vietnam Veterans Wall of Faces but it’s a wonderful website, especially with all the detail it includes. Do you know how the soldiers come to be included — are their names and photos submitted by family or other soldiers? It looks like his brother wrote a message at the link in this post. Nancy, I appreciate your kind words. I agree that John was cheated out of a life of possibilities. It was so unfair to him and his family. I don’t know the background of the Wall of Faces but am grateful to have found it. I had no idea that John’s brother wrote a message – I’ll go back and look for it. This is beautiful. I hope through sharing what you know here, someone will contact you who can tell you more about him. I do, too, Laura. Thanks so much for stopping by. Wonderful tribute you wrote! I did the same for my grandfather’s brother who I never got to know because of war, and has no one else to remember him. My husband did two tours in Viet Nam and, like all other husbands, brothers, cousins, fathers and grandfathers, only speaks of fun adventures and misadventures of war, not the horrors they faced and lived on a daily basis. Carl, I am beyond moved by your words. Thank you so much for writing and adding those important details to your family’s story. I will e-mail you under separate cover. Meanwhile, please know of my deepest gratitude and warm regards.